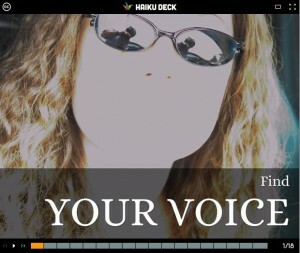 If you haven’t played with it yet, try out Haiku Deck (http://www.haikudeck.com/). It’s an online software tool/iPad app that helps you create amazing presentations by pulling in new and fresh images automatically. Because I have strong visual tendencies, I use it to help me draft content and find what needs more focus. I love it! I’d be happy to share more about how I use this tool, if you’d like.